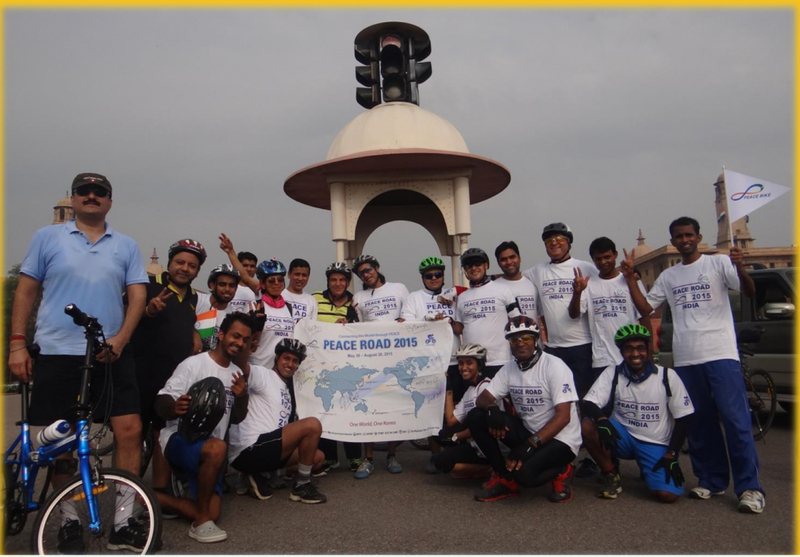 FFWPU India: On July 19, we launched Peace Road in India at the Connaught Place, in New Delhi. That Sunday was Raahgiri Day, a car-free day in New Delhi. This is launching was supported by very prestigious institutions in India. The Times of India, the number one daily newspaper in India; the Raahgiri Day Team, the New Delhi Municipality Council and the Delhi Police supported this launching ceremony. In the program were Hon. B. P. Singh, Former Governor of Sikkim and Chairman of UPF-India; Shri Shyam Jaju, National Vice-President of Bharatiya Janata Party (Current Ruling Party of India); Hon. (Smt.) Meenakshi Lekhi, Member of Parliament of India; Hon. Subash Arya, Mayor, South Delhi Municipality Corporation; Dr. Parmod Kumar, Asst. Professor, IGNOU and the President of Youth Federation for World Peace-India came to flag off the cycle rally for peace organized on the occasion of this Peace Road-2015 India. Hundreds of participants sang and danced to songs of peace sung by the band VISUDH and each VIP delivered short remarks to show their solidarity with this Peace Road project. Mr. Krishna Adhikari, Secretary General of UPF-India and National Leader of FFWPU-India, highlighted the significance of the Peace Road project being carried out throughout the world in honour of the commemorative celebration of the third anniversary of the late Rev. Dr. Sun Myung Moon and informed the audience about the grand vision of Father Moon for connecting the world through building an International Peace Highway in order to build a world of peace. After the launching event, about forty cyclists covered a distance of nearly 12 kilometers.